This year for a four-year old's birthday, we decided to have a pool party. It was really fun and went well. We rented a conference room that was just off the indoor pool at a local motel. The price was reasonable and the accommodations were great. We had four hours at the pool so we decided to provide lunch and cake since we knew four hours was too long just for swimming. We prepared a chili releno-type casserole and made our favorite GAPS birthday cake. Any kid-friendly casserole is great for this type of party, because it stays nice and warm, and is easy to serve. My friends helped bring food and we ended up with some chips and salsa, grapes and whipped cream and some organic boxed juices from Costco. A thermos full of water proved useful too as the children were thirsty when they were done swimming. 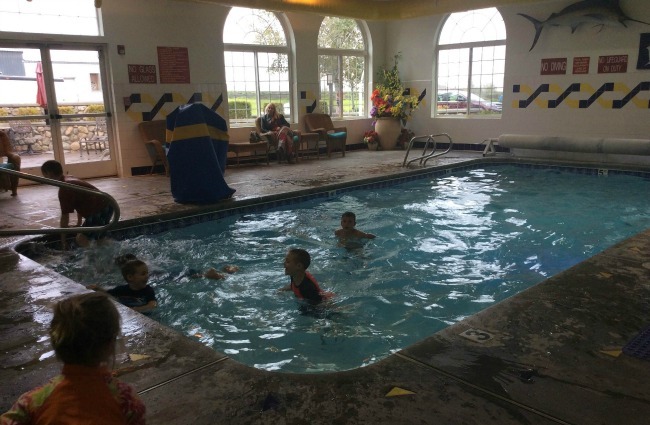 With so many little ones, parents had to be in both the pool and the hot tub at all times. Everyone had a great time. We needed to pack along quite a bit of stuff to the pool but all our garbage and the clean up was taken care of by the motel staff. Getting the party stuff out of the way before swimming made the party low stress and all the more enjoyable. We didn't need to think of any activities or provide party favors due to the nature of the party which offset the difficulty of packing everything in and out. No swimming was allowed until we ate lunch, sang Happy Birthday and had cake and opened presents. It was close to three before we got all the birthday stuff out of the way and got into the pool. I would definitely recommend throwing a pool party of your own either at a motel, a public pool or a backyard pool.